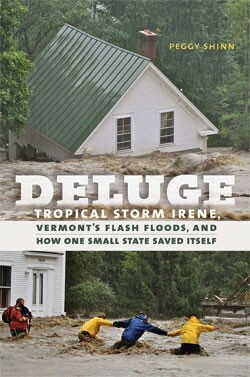 Those are just a few of the chilling testimonies quoted in Peggy Shinn’s new book Deluge: Tropical Storm Irene, Vermont’s Flash Floods, and How One Small State Saved Itself (University Press of New England, 232 pages, $27.95). Arriving just in time for the second anniversary of the storm’s devastation, this account from a Rutland freelance journalist offers both a comprehensive and a compelling overview. Sure, Vermonters have heard the stories before — or lived them. Shinn organizes her narrative around individuals whom she follows from the night before the storm through its aftermath and recovery. Among them are Heather Grev, who had to be rescued by a human chain as her “picture-perfect house” in Pittsfield was engulfed; Wilmington clerk Susie Haughwout, who rushed to save her town records; and South Royalton organics grower Tom “Geo” Honigford, whose farm bore a name — Hurricane Flats — that proved all too prophetic. Shinn gives these stories a depth they lack in most contemporary news accounts, and she provides valuable context — including flashbacks to the ruinous 1927 and 1938 floods — that helps explain why no one anticipated the damage Irene wrought. Vermont’s landscape of steep hills, narrow roads and burbling brooks is all too propitious for flash flooding, Shinn reminds us. But it’s also one of the world’s best places to walk. Hinesburg writer Nicole Grubman explores the quieter side of that landscape in I Left My Sole in Vermont: A Walker’s Journey and Guide Through Central Vermont Back Roads (Red Barn Books, 104 pages, $15.95). She guides readers through 23 back-road jaunts — many of them loops — in the Mad River Valley, the “backsides of Montpelier,” Calais, Plainfield, Marshfield and beyond.